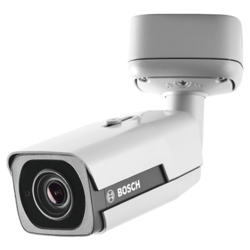 Leading Distributor / Channel Partner of bosch nbe-4502-al, 2mp, 1080p, 2.8-12mm ip bullet camera, bosch nbe-5503-al, 5mp, 2.7-12mm ir bullet camera, bosch nbe-6502-al, 1080p, 2.8-12mm, ir bullet camera, bosch nti-50022-a3 1080p, 2mp, 2.7-12mm, 30mtr ir bullet camera, bosch nti-50022-a3s, 1080p, 2.7-12mm, 30 mtr ir bullet camera and bosch nai-90022-aaa dinion ip imager 9000 hd camera from New Delhi. 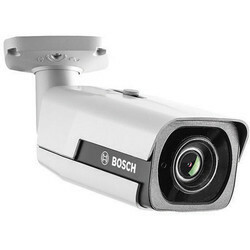 The 1080p infrared bullet from Bosch is a professional surveillance camera that provides high quality HD images for demanding security and surveillance network requirements. This robust bullet camera is a true day/night camera offering excellent performance day or night. The builThe 1080p infrared bullet from Bosch is a professional surveillance camera that provides high-quality HD images for demanding security and surveillance network requirements. This robust bullet camera is a true day/night camera offering excellent performance day or night. The built-in infrared LEDs provides quality night time monitoring with 60 m (196 ft) viewing distance in darkness. The 5MP infrared bullet from Bosch is a professional surveillance camera that provides high-quality images for demanding security and surveillance network requirements. This robust bullet camera is a true day/night camera offering excellent performance day or night. The built-in infrared LEDs provides quality night time monitoring with 60 m (196 ft) viewing distance in darkness. 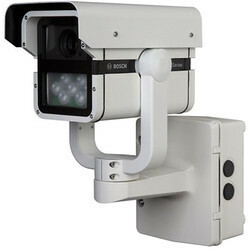 Outdoor bullet camera with Automatic Varifocal lens The robust aluminum housing provides high installation flexibility. The camera resists both water and dust ingress in tough environments and is rated to IP67 standards. The 2.7 to 12 mm AFV (Automatic Varifocal) lens allows you to choose the coverage area remotely. The automatic zoom/focus lens wizard makes it easy for an installer to accurately zoom and focus the camera for both day and night operation. The AFV (Automatic Varifocal) feature means that the zoom can be changed without opening the camera. The automatic motorized zoom/focus adjustment with 1: 1-pixel mapping ensures the camera is always accurately focused. Essential Video Analytics The built-in video analysis reinforces the Intelligence-the-Edge concept and now delivers even more powerful features. Essential Video Analytics is ideal for use in controlled environments with limited detection ranges. The system reliably detects, tracks, and analyzes objects, and alerts you when predefined alarms are triggered. A smart set of alarm rules makes complex tasks easy and reduces false alarms to a minimum. Metadata is attached to your video to add sense and structure. This enables you to quickly retrieve the relevant images from hours of stored video. Metadata can also be used to deliver irrefutable forensic evidence or to optimize business processes based on people counting or crowd density information. The high dynamic range mode is based on multiple exposure processes that capture more details in the highlights and in the shadows even in the same scene. The result is that you can easily distinguish objects and features, for example, faces with a bright backlight. The actual dynamic range of the camera is measured using Opto-Electronic Conversion Function (OECF) analysis according to IEC 62676 Part 5. This method is used to provide a standard result which can be used to compare different cameras. The low-noise image and the efficient H.265 compression technology provide clear images while reducing bandwidth and storage by up to 80% compared to standard H.264 cameras. With this new generation of cameras, an extra level of intelligence is added with Intelligent Streaming. The camera provides the most usable image possible by cleverly optimizing the detail-to-bandwidth ratio. The smart encoder continuously scans the complete scene as well as regions of the scene and dynamically adjust compression based on relevant information like movement. Together with Intelligent Dynamic Noise Reduction, which actively analyzes the contents of a scene and reduces noise artifacts accordingly, bitrates are reduced by up to 80%. Because noise is reduced at the source during image capture, the lower bitrate does not compromise image quality. This results in substantially lower storage costs and network strain and still retain a high image quality and smooth motion. The 1080p infrared bullet from Bosch is a professional surveillance camera that provides high-quality HD images for demanding security and surveillance network requirements. This robust bullet camera is a true day/night cameraoffering excellent performance day or night. The built-in infrared LEDs provides quality night time monitoring with 60 m (196 ft) viewing distance in darkness. Outdoor bullet camera with Automatic Varifocal lens The robust aluminum housing provides high installation flexibility. The camera resists both water and dust ingress in tough environments and is rated to IP67 standards. The 2.8 to 12 mm AFV (Automatic Varifocal) lens allows you to choose the coverage area remotely. The automatic zoom/focus lens wizard makes it easy for an installer to accurately zoom and focus the camera for both day and night operation. The AFV (Automatic Varifocal) feature means that the zoom can be changed without opening the camera. The automatic motorized zoom/focus adjustment with 1: 1-pixel mapping ensures the camera is always accurately focused. The 1080p infrared bullet from Bosch is a professional surveillance camera that provides high-quality HD images for demanding security and surveillance network requirements. This robust bullet camera is a true day/night cameraoffering excellent performance day or night. The built-in infrared LEDs provides quality night time monitoring with 30 m (98 ft) viewing distance in darkness. Outdoor bullet camera with automatic varifocal lens The robust aluminum housing provides high installation flexibility. The camera resists both water and dust ingress in tough environments and is rated toIP66 standards. The 2.7 to 12 mm automatic varifocal lens allows you to choose the coverage area remotely. The automatic motorized zoom/focus adjustment with 1: 1-pixel mapping ensures the camera is always accurately focused. ntelligent Dynamic Noise Reduction reduces bandwidth and storage requirements The camera uses Intelligent Dynamic Noise Reduction which actively analyzes the contents of a scene and reduces noise artifacts accordingly. The low-noise image and the efficient H.264 compression technology provide clear images while reducing bandwidth and storage by up to 50% compared to other H.264 cameras. This results in reduced-bandwidth streams that still retain a high image quality and smooth motion. The camera provides the most usable image possible by cleverly optimizing the detail-to-bandwidth ratio. The 1080p infrared bullet from Bosch is a professional surveillance camera that provides high-quality HD images for demanding security and surveillance network requirements. This robust bullet camera is a true day/night camera offering excellent performance day or night. The builtin infrared LEDs provides quality night time monitoring with 30 m (98 ft) viewing distance in darkness. 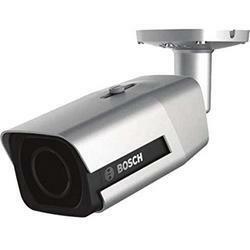 Outdoor bullet camera with automatic varifocal lens The robust aluminum housing provides high installation flexibility. The camera resists both water and dust ingress in tough environments and is rated to IP66 standards. The 2.7 to 12 mm automatic varifocal lens allows you to choose the coverage area remotely. The automatic zoom/focus lens wizard makes it easy for an installer to accurately zoom and focus the camera for both day and night operation. The AFV (Automatic Varifocal) feature means that the zoom can be changed without opening the camera. The automatic motorized zoom/focus adjustment with 1: 1-pixel mapping ensures the camera is always accurately focused. Intelligent Dynamic Noise Reduction reduces bandwidth and storage requirements The camera uses Intelligent Dynamic Noise Reduction which actively analyzes the contents of a scene and reduces noise artifacts accordingly.The low-noise image and the efficient H.264 compression technology provide clear images while reducing bandwidth and storage by up to 50% compared to other H.264 cameras. This results in reduced-bandwidth streams that still retain a high image quality and smooth motion. The camera provides the most usable image possible by cleverly optimizing the detail-to-bandwidth ratio. The DINION IP imager 9000 HD is a rugged, active infrared surveillance camera designed for fence line or perimeter surveillance and other outdoor low-light applications. The camera provides up to 120 meters (394 feet) of classification level imaging and 33 meters (108 feet) of recognition level imaging in darkness. The IP66 and IK10 ratings ensure water/dust and vandal resistance making it ideal for demanding applications. Designed for critical infrastructure applications, the rugged infrared imager consistently delivers high-quality 1080p HD images at 30 is in any lighting conditions. The wide dynamic range sensor gives high quality 1080p HD images during the daytime and provides exceptional night-time performance with the integrated IR. The SR (Super Resolution) lens is designed to provide improved image resolution and sharpness, and better depth-of-field while avoiding the diffraction issues which can occur with megapixel sensors. Its advanced SR-iris design ensures the sharpest image possible, even in the corners.The highly integrated all-in-one solution, with integrated illuminator and junction box, reduces installation time. This, together with remote lens adjustment and remote IR level control makes installation a lot easier and more convenient. The reliable, rugged construction makes the imager suitable for tough environments and demanding applications such as perimeter surveillance, critical infrastructure surveillance, and public area surveillance. The camera contains the Bosch Intelligent Video Analysis (IVA) application making it a very powerful tool in unmanned perimeter surveillance applications. IVA also contributes to the content-based scene analysis which optimizes image processing and reduces bandwidth and storage requirements. The integrated high-power infrared illuminator operates at a wavelength of 850 nm which provides semi-covert illumination with an excellent range. IR intensity is remotely adjustable. The illuminator can be tilted, and the width of the IR beam is adjusted by placing the 3D diffuser in the IR illumination path. This ability to adjust the IR beam pattern in the field gives a broad coverage and greatly reduces setup time and effort. Variable field illumination also provides even illumination not only across the horizontal field of view but also from foreground to background. IR on/off and camera day/night switching is controlled by the image brightness level and the ambient visible light sensor. The switch point is also remotely adjustable. To ensure this performance never fades over time, the IR imager features constant light technology, using closed-loop feedback to control infrared performance throughout the life of the unit.